There was a time in US Cinema history where Universal Studios held a monopoly on films which frightened movie goers and brought us into the modern era of monster films. This period of time, in my opinion, started with Dracula in 1931 but really became something special with the release of a film in that same year that featured my favorite monster. That film was Frankenstein. It is said when Frankenstein’s monster made his first appearance in the film, people had never seen anything like it. People screamed and some even fainted. Universal knew they had something unique and unsettling. The film starts with Edward Van Sloan, who appeared as Van Helsing in Dracula, giving a warning about the content of the film before it starts. I would have loved to have been in the audience of one of the original screenings in 1931 to experience it. Unfortunately, I was born about 43 years too late. This was followed up in 1935 with The Bride of Frankenstein. I love this film and like it a little bit more than Frankenstein. In it, we see the return of Colin Clive as Henry Frankenstein, Boris Karloff as the Monster and James Whale returns to direct the film. The film brought us Elsa Lanchester playing two very prominent roles for the film, Mary Shelley and “The Bride” who is repulsed by the very sight of the Monster. The film ends with The Monster blowing up both The Bride and himself…….or so we thought. 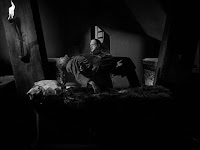 Death should never be an impediment to a good monster and it was decided, rightly so, to bring back the monster again in Son of Frankenstein (1939). This time some changes were going to take place in the world of Frankenstein. This is the first of the Frankenstein films to not be directed by James Whale. He needed some persuasion to take the helm of Bride of Frankenstein. He had become disenchanted with the genre of horror and wanted to direct different types of films. He was replaced by Rowland V. Lee who also produced the film. Colin Clive had passed away in 1935 at the very young age of 37. He was a chronic alcoholic and died from complications of tuberculosis. If you ever have a chance, take a look at his entry in IMDB. He made quite a few films between 1930 and 1937. It looks like he could’ve had a very promising career before his life ending so soon. Replacing him in a similar role would be the great Basil Rathbone taking the role of Henry Frankenstein’s son Baron Wolf Von Frankenstein. Returning as the Monster for the final time is Boris Karloff. While watching the film, there is something magical about his performance that no one else playing the role has ever been able to achieve. Bela Lugosi joins the cast as the demented and manipulative Ygor who uses the Monster to carry out treacherous and murderous deeds for his benefit and gain. Generally, when I randomly pick something to watch, it tends to focus on British television. There are other things I am interested in which I put into the mix. One of them is the Universal Monster genre. There is something so iconic about all of these monsters which set the template for everyone else to follow over the years. It’s nice to pull these films off the shelf once and a while and take a look at them. 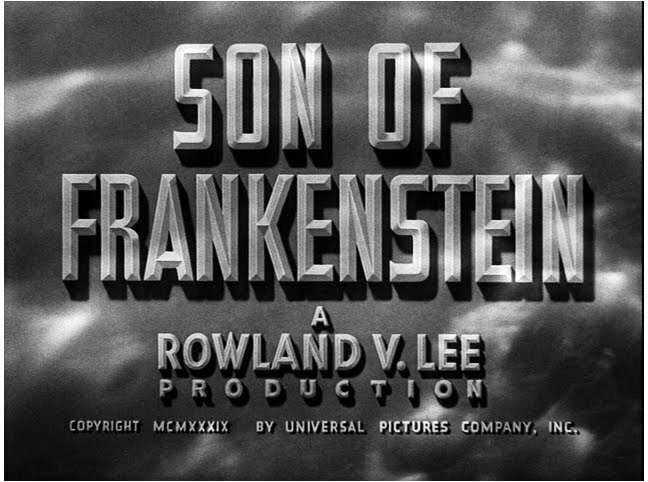 Son of Frankenstein, to me, is a really transitional film in the genre. 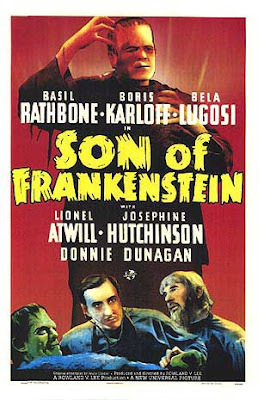 The film starts with Baron Wolf Frankenstein returning to his ancestral home with his family in the village of Frankenstein. Now, here is the question: is this the only time this village had been called Frankenstein? I don’t recall it being used in any of the other films. I thought the castle was called Castle Frankenstein in the first film. I think the village being named this is a nice touch. His father died around the time Wolf was born or when he was very young. The Baron is going to live in Castle Frankenstein. The Baron, being aware of what his father did, is unconvinced that all the stories about his father and his creation were true. When the Baron arrives, he is met by an unfriendly mob. Have you ever heard of a friendly mob? What makes this film interesting is that we are given a look at how this village is coping, even after so many years, with the affect Henry had on the village by creating his monster. We see that the no one wants to visit the village anymore and it is not as prosperous as it once was. Immediately, as the word of a Frankenstein’s return spreads, the village is skeptical and frightened that this Frankenstein will carry on his father’s experiments. Upon their arrival at Castle Frankenstein, we meet Inspector Krogh. Krogh is able to help the Baron understand that the tales about the destructive nature of the Monster was not overblown. Krogh has one fake arm. His original arm was ripped out by the Monster when Krogh was small child. From the start of the film, the Baron is very sympathetic for his father’s experiments. He feels that no one understood what Henry was trying to do with his experimenting. He wasn’t trying to create a monster, he was creating a man. Wolf blames the villager’s hatred of the Monsters not on the fact the Henry did something immoral or trying to be God but the blame should be placed on the assistant who provided the wrong type of brain. It doesn’t matter to Wolf that his father gave his assistant the permission to rob graves to provide the necessary body parts for his experiment. It is this acceptance of his father’s experiment which moves the film along. As the Baron is looking at his father’s dilapidated laboratory, he meets Ygor. Ygor takes the Baron to a crypt just adjacent to the lab where Wolf sees the crypts of his father and grandfather. What surprises the Baron is that the Monster is still alive. There were rumors in the village that he still existed, as there have been some mysterious deaths in the village over the years. However, no one was able to provide evidence to back this up. Frankenstein finds the Monster in a coma. 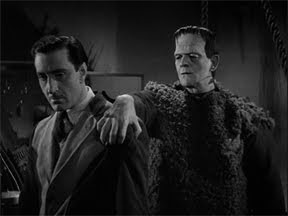 Ygor wants Frankenstein to help treat the Monster to make him better. Ygor is smart; he knows that the Baron will do this because he admires his father’s work. The Baron thinks that not only can he treat the Monster, he can better the work started by his father. After the Monster is out of the coma, the film switches to the standard “Monster Movie” affair and there is nothing wrong with that. Ygor uses the Monste r to take revenge on the remaining men who were a part of the jury which originally sentenced Ygor to be hanged. Obviously, Ygor survived this but with a broken neck and he wants revenge on the people who were on that jury. He gets the Monster to murder the final two jury members. This causes a massive uproar in the Village. Cue angry mob. Many people suspected the Baron might be up to something and Krogh goes up to investigate. Eventually the Baron has enough of Ygor and kills him. He tells Kogh it was self-defense. Once the Monster realizes he has lost his only friend, tries to take revenge by kidnapping the Baron’s son Peter. 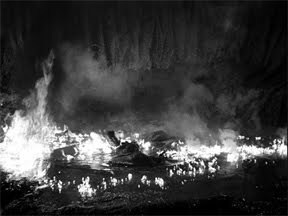 This climaxes in the laboratory where the Baron kicks the Monster into a molten sulfur pit giving the Monster a fiery end. Then, the Frankensteins decide to leave the village and allow the village to do whatever they want with the castle and laboratory. Curiously, although Inspector Krogh knows that the Baron is responsible for not only bringing the Monster back to life in a sense but hiding this information from the Inspector or anyone else, he is allowed to go free. Even when they board the train, they do so to the sound of a lot of a cheering crowd. Or is that a happy mob? I’m so confused! This is a really good film with strong performances. Rathbone plays the Baron as someone who admires his father’s work but is cracking under the pressure of Krogh who clearly suspects him that something is go on up at the castle. Lugosi is amazing in this film. Perhaps his is the strongest performance. Ygor is mentally unhinged and generally holds all the cards for most of the film. He is able to use secret passage ways to get around to spy on people and he has a way of making the Monster do his bidding. Often Ygor does this through playing his recorder which somehow to get the Monster to follow his orders. 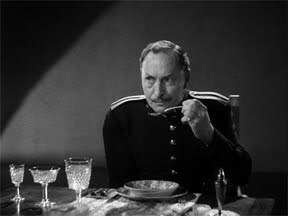 Lionel Atwill plays Inspector Krogh with sympathy. He is an interesting character. He was badly maimed by the Monster when he was a child but he puts his duty before anything else. He wants to make sure the Frankenstein family is safe even when the villagers want to tear them a part. He is also a gentleman who clearly as an idea of what is going on but is smart enough to hold on to his cards until he knows for sure. Karloff returns for his third and final time playing the Monster in a Universal Monster film. The Monster will be played by other actors when the series continues, including Bela Lugosi in one of them. It is sad to see the monster take a step back from The Bride of Frankenstein. In that film, the Monster learns to form thoughts and articulate them in sentences. He evolved while everyone else stays the same. Most people don’t understand him and want to destroy him. To me, this is why it is a transitional film. The Monsters is less and less about this and more of him being used as a murderer. I think the Monster de-evolves further into just being a “monster” by the next film. I sometimes wonder if this character change in this film helped Karloff decide to no longer play the role. The films that have Karloff as the monster are so different to the ones without him. Karloff acted with many different emotions in the role. You knew how he felt without him uttering a word; he was amazing. What about the son of the son of Frankenstein? He was played by Donnie Dunagan. What is up with his accent? Is there something wrong with him? My guess is that maybe someone told him to speak with a British accent to possibly mirror Rathbone but he couldn’t manage it. It became more Louisiana Bayou. He later went on to provide the voice for the child version of Bambi in 1942. He was 5 when he played Peter Frankenstein. He is now 75. The sets are amazing. What really jumps out at me is the use of shadows. 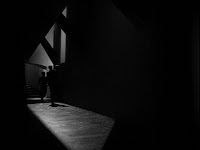 A lot of the sets are lit so set pieces are shadowed on the wall such as stairwells and laboratory equipment. Strickfadens were also used in the film although not as much as the previous two films. What are Strickfadens? That is fan name to all of the equipment used in the laboratory scenes that had lights and electricity coming out of it created by Kenneth Strickfaden. The music is quite good too. Composed by Frank Skinner it is very similar to some of the cues in The Bride of Frankenstein composed by Franz Waxman. Was this deliberate? I watched this film from the Legacy collection DVD released in 2004. The image looked great and there was a nice amount of grain on the picture. The blacks looked strong and it did not look like there was too much print damage. What I like about this set is that it takes all of the Frankenstein films and put them together in one nice little neat package! Of course, what I think many of us are waiting for is that these films need to be released on Blu Ray fully restored with some love and care. 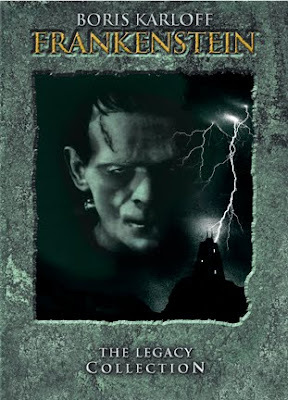 This is a film that really makes a nice, loose trilogy of the Frankenstein story. After this, the message starts to get a little diluted although still always fun to watch. But for Son of Frankenstein, this is the real deal and the last of its kind. Next week: I go back to British and American television where I have a mini marathon of programs from the year 2001. I will be watching a couple of episodes from each of the following programs: Absolutely Fabulous, Family Guy, Futurama, Jonathan Creek, Only Fools and Horses, and The Simpsons. Why am I looking at episodes from 2001 and why these series, check back next week to find out. It is nice to go back and look at these films. I can actually remember the first time I saw this movie as a kid. They showed it on our PBS station WILL in Urbana, Il when I was in second grade we used to have as the final program of the night have a guy introduce films and give a brief glimpse into the history of it. I saw this was playing and asked my Dad to record it. I agree BluRay would be nice and hopefully Universal does a nice restoration of it simular to Warner's Wizard of Oz or Gone With The Wind transfers. It would be interesting to see what a Blu Ray would look like. I thought this looked quite good on my HD set up but wonder if they went back to the original negs when preparing the legacy releases. They may have gone back to the negs for each of the main films in these sets but I wonder if they just grabbed whatever was available for everything else. My understanding the only film to recieve a new transfer was Bride of Frankenstein in which Universal corrected the framing issue problem it had on the original DVD release from the legacy collection of the Wolfman, Frankenstein, and Dracula off the films previously released on DVD. Oh, that's good to know. I guess that makes sense. Did you ever pick up the 75th Anniversary release of Dracula? I haven't since I had the Legacy release. I've heard good things and bad things about it. Obviously, the next release I would get of any of these films would be on Blu Ray. I have them all on DVD already and even though it is a later transfer I could not justify buying them again when I know Blu Ray is out and have a Blu Ray player with HDTV setup. I hope Universal takes the time to clean these ups and send them through the 8k restoration process used on Wizard of Oz BluRay.